Performance measures relate to how individual projects are progressing. In this process, keep in mind to analyze not only if goals are being met, but also if all the resources are being utilized to their maximum capacity. Performance measures and analysis shouldn’t just involve the executive decision makers, but the entire team. This will help encourage and motivate the QA team to maximize productivity. There are many other benefits of performance measurements as well including, but not limited to understanding the problems in the process, analyzing the customer expectations and making improvements to current processes. Below are two examples of metrics that can be measured. 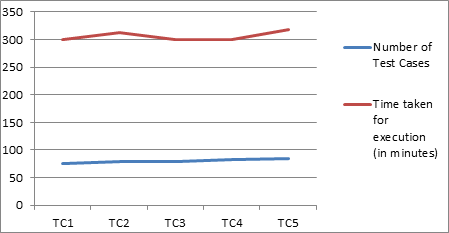 This is a way to measure the stability of builds over time. It can also be used to compare various builds. 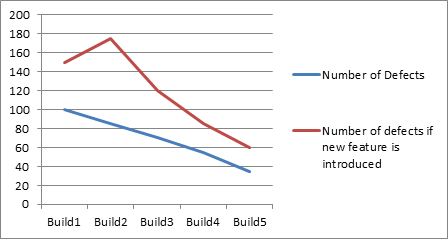 The number of defects found should decrease from one build to the next over the course of the project. However, if a new feature is introduced, this may not be the case. In fact, additional features may actually increase the bug count. Over the course of the project, the number of defects found in each build should steadily decrease till the build becomes stable. A team’s testing efficiency can be measured by how long it takes to perform selected tests. The first time a test (or set of tests) is executed, the number should be higher than subsequent executions. As the QA team becomes familiar with each test and learns to make them run smoother, test time should fall. In this case, setup and subsequent result results should take less time. To make this metric even more beneficial to your QA team, identify which tests can be run concurrently or in parallel to gain time efficiency. There are many other metrics that can be measured in order to maximize productivity and deliverability of your QA team. Using these metrics can help you manage your QA team more effectively and track your progress overtime. What measures or metrics do you find the most beneficial? Comment below and let QASource know. Also, be on the lookout for a detailed list of over 20 different performance metrics that VPs use to measure their QA team. Don’t forget to follow QASource on LinkedIn.